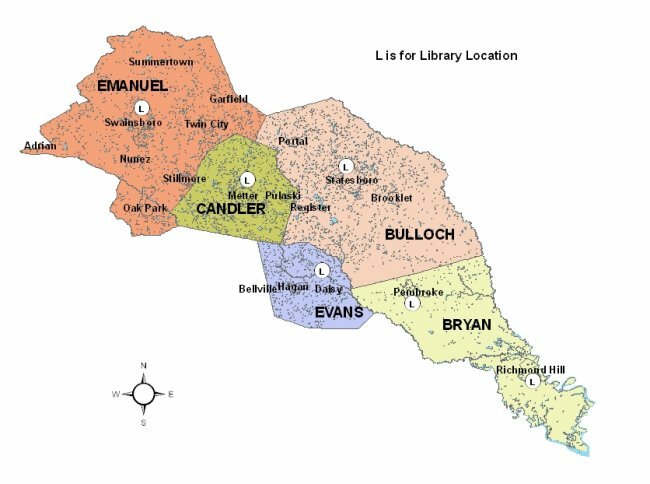 The Statesboro Regional Library System is a group of 6 southeast Georgia public libraries, serving Bryan, Bulloch, Candler, Emanuel and Evans Counties. Click here for phone numbers and addresses for our libraries. Search for Statesboro Regional System in the find a library system. It will give the results for all of our branches. All of the Statesboro Regional Libraries boast a full range of books, videos, CDs, and DVDs along with reference and readers advisory services, adult and children’s programming, and Internet access. In addition, there is a great deal of interest and support for genealogy and local history with dedicated genealogy areas at the majority of our libraries. Georgia PINES System , which links all the member libraries together with 300 libraries across the state, and enables patron’s access to books from any library in the Pines system.